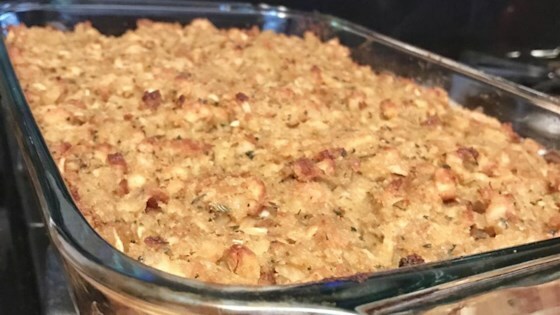 "Rotisserie chicken and the prepared quick-cook stuffing adds wonderful flavor to this casserole. It's yummy left over too!" Preheat oven to 375 degrees F (190 degrees C). Spray a 9x13-inch baking dish with cooking spray. Bring water and 1/4 cup butter to a boil in a saucepan; stir in stuffing mix. Remove saucepan from heat, cover, and let sit until water is absorbed, about 5 minutes. Fluff stuffing with a fork. Heat 1 tablespoon butter in a skillet over medium heat; cook and stir onion and celery until softened, 5 to 10 minutes. Mix cream of chicken soup, sour cream, and cream of mushroom soup together in a bowl. Spread shredded chicken into the bottom of the prepared baking dish. Layer onion mixture over chicken and season with salt and pepper; top with soup mixture. Spread stuffing over soup mixture layer. Bake in the preheated oven until lightly browned and bubbling, about 1 hour. See how to make a terrific weeknight casserole. I made this exactly as written and really liked it. It didn't look bad either!